Fairy Tail 303 is now available up next. The four dragon slayers including Grey and Lucy was able to discover the secret behind Eclipse Project. But Lucy and Yukino were captured by the army and Natsu and the rest was left with no choice but to finish and win the Daimatou Enbu. What will be Fairy Tail’s next strategy? Find out in Fairy Tail 303. UPDATE: Fairy Tail chapter 303 is now available. You can begin reading this chapter on popular manga sites online. Please do support Fairy Tail Manga by buying the Volumes when they become available in your region. As of to date, Fairy Tail 303 spoiler is not yet available. In fact, sometimes spoilers or raw scans are not leaked anymore. But there are still times that confirmed spoiler tends to get spread in the web. I’ll update this portion if ever I spot a confirmed spoiler or raw scans for Fairy Tail 303. The whole Eclipse project sounds a little bit insane. It’s like back to the future thingy. 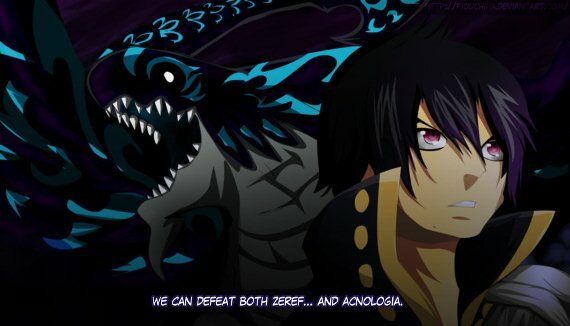 Whoever enters the huge gate and travels back in time gets a chance to defeat Zeref and Acnologia. Perhaps it’s best to defeat Zeref before his powers grew and become immortal. It’s also best to defeat Acnologia when he was still human before he got dragon slaying powers. But defeating Zeref or Acnologia while in the past will created a major change in the course of history. I think the Eclipse project will fail, since things would get messed up if ever history was altered. Lucy and Yukino got kidnapped by the Kingdom’s army, what could be Fairy Tail’s next move on this. My guess is Fairy Tail will have no choice but to finish and win the Daimatou Enbu and get an audience with his majesty. Other Fairy Tail members might try to save Lucy, they must. Since Lucy is part of the kingdom’s evil plans. I also think that Yukino is not bad at all and might join or help Fairy Tail. I’m still clueless as to who is the mysterious girl Jellal encountered. I’m sure she’s connected to this whole Dragon Festival and July 7th. Any idea? Just leave your thoughts below. I’ll update this post once Fairy Tail 303 spoiler becomes available. Hopefully by Thursday or Friday. but I’ll definitely update this post once the chapter Fairy Tail 303 is released. Stay tuned!